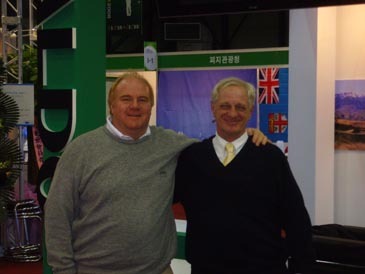 Nick Edmund(left), managing director of Faldo Design,poses for camera with his colleague at Seoul International Golf and Resort Exhibition 2008 on Feb. 28. Faldo Design intends to join in construction of golf course projects in Korea and elsewhere in Asia earnest in the months to come, according to Nick Edmund, managing director of the London-based golf course design company. With more than 30 projects in every corner of the globe, Faldo Design's impressive portfolio reflects the adaptability and passion by which Faldo made his name on the golf course. In Korea, Faldo Design was responsible for Jinan Country Club in Cholla Namdo, some 350 km south of Seoul, which was dedicated about two years ago, according to Mr.Edmund who was here last week to participate in the Seoul International Golf and Resort Exhibition 2008 held at SETEX in southern Seoul from Feb. 28 through March 2. "At present, we are working on feasibility study on construction of more golf courses in China, Indonesia, Thailand, the Philippines, Cambodia and Vietnam as well," he said pointing out that what set Nick Faldo apart from the other great players of his generation was his innate ability to craft even the most challenging of golf shots and his instinctive appreciation for the varying demands of any given course. By applying these very same principals to the golf course design process, Nick Faldo has built up a reputation as one of the world's most talented player-designers, he explained. Faldo Design is headed by Mr. Edmund and Andrew Haggar,Director of Architecture, who leads the studio design team which is responsible for all our in-house projects. "As a company, we are very selective; we are driven by quality rather than quantity. In fact, our pioneering approach to course selection has resulted in projects as far afield as Cambodia, Russia and the Dominican Republic. Each of these projects is treated as individual and unique - as are the close relationships that we nurture with the clients we work with throughout the world," he said. Faldo Series Asia tournaments held in different countries and territories across Asia give leading young golfers, male and female aged 11 to 21, the opportunity to experience top-level competition under strict tournament conditions. Players also benefit from an educational seminar on a topic relating to golf, enabling them to develop an all-round knowledge of the sport. At the same time, younger children from the local community have the opportunity to attend Faldo Series Asia tournaments and experience golf for the first time, both as spectators and participants. The leading players from each Faldo Series Asia tournament qualify for the Faldo Series Asia grand final, together with invitees from other Asian countries. This prestigious event is hosted by Nick and played on the Faldo course at Mission Hills Golf Club in China, home of the Faldo Series Asia and officially the world's largest golf resort. Nick spends time with the finalists and plays with the winners. He also selects invitees to compete in the annual Faldo Series grand final in Europe. Results count towards The R&A's World Amateur Golf Ranking. Underwritten by Nick, the Faldo Series Asia is supported by The R&A, together with a number of brands and businesses. It is sanctioned by the Asian Tour and the Asian Pacific Golf Confederation.